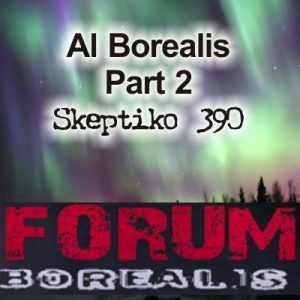 Al From Forum Borealis joins me for a conversation about technology and consciousness. The download for this podcast fails, saying "Failed - no file". This might be that I have just tried to access this as you are setting it up - I don't know! I couldn't download it to my hard drive as I usually do either, David, and nor could I listen to it directly from the site. Thanks Alex - it seems to download now. I like the idea of supplying an index to the podcast - is that going to be a permanent feature? I am yet to listen to the podcast. Is ET manipulating our consciousness with technology? Or is ET manipulating our consciousness with their own consciousness? A common theme to the abductee/close encounter story is telepathy. Presumably they seem to have “miraculous” abilities of consciousness. Are they using this power of their own mind to manipulate us? Or are they using tech AND their own consciousness? It’s even possible that there is no technology involved at all, in the way that we think of technology, and it’s all conscious ability. Then again, it’s also possible that they are using ONLY technology and it making it seem like miraculous powers of mind. But I don’t think that is likely. I also think it’s not at all unlikely that most of the tech they show us is theater. This was sort of a theory that Vallee cooked up decades ago, and I fully subscribe to it. They don’t need large needles to get DNA from us, and they don’t need lights on their ships to see where they are going, as a couple of examples. But the examples are endless if you dig into the accounts. They also give ridiculous answers as to where they come from. They told Pietro Zanfretta that they are from “the third dimension.” They, apparently, told onlookers during the airship sightings of the late 1800s that they were from “the land above the clouds” and that they were “descendants of the lost 12 tribes of Israel. They told Contactees in Europe that they are from the “land with no sun.” Sounds like made up theater to me. A lot of mental stuff seems to be going on with a lot of theater. And it seems that during NDEs or Astral traveling, the experiences can indeed manipulate their surroundings, and often this experience “feels” as physical to the experiencer as everyday waking life here on Earth feels. And they are doing this with their consciousness, perhaps, in a similar way that ET may be doing so in our realm. And it may be that there is no technology involved at all. 24:50 -- 26:12 He reveals himself here. The conversation, the covert manipulation, reveals itself. Whether or not you two were aware of this, here is where the "daemon" entered, if we can have a bit of fun and call it that. also diversion/red herring, what are the important aspects of the question, where is that being derailed? Arghhhhh! Can someone talk in meaningful English please? Sorry, don't mean to frustrate anyone! Here's how I see it as directly as possible. In a similar way that Al's bubble noise redirected the right brain away from what he's saying, now he's done it in words. Now this may very well be how a masculine/feminine or right/left brain as it is currently scientifically defined works--sophistry works very well on the feminine or non-logical side of the mind/brain. The masculine side can be very tunnel-like, honing in brilliantly like the scientific mind is known to do. The right-brain feminine does the something like the opposite, right? It sort of imprints the territory and intuits, like an infant might coming straight from the womb, certain things are clearly apparent for its survival and it responds automatically. So when I'm hearing a conversation, as a one more feminine in knowing, when that conversation is being derailed, I'm hyper-sensitive to it. Now look at what happened in this portion of the interview, very early on really. "I was really having a revelation and I can't for the life of me remember it now." What does this do to the train of thought of a right-brain dominate person? I can tell you, it totally derails it. And, further more, I think part of him knows this. But, who knows, I will give him the benefit of the doubt for 30 more minutes. Or are they using tech AND their own consciousness? seems like a tech component is involved in some/many... but again we're not sure what we're looking at here... i.e. are we looking at many different ETs with all sorts of diff agendas? There’s a really interesting phenomenon underlying virtually all sorts of paranormal phenomenon, and I’ve talked about it here in the past because I don’t think this thought gets enough attention. In every area, credible people, by the hundreds and thousands have their attempts at documenting paranormal phenomena ruined by “the trickster.” This holds true in demonology, UFOs, crytpozoology, etc etc etc. I was gonna I start listing notable instances, but I don’t know where to begin. I even know people personally whose cameras broke down on them at the most crucial moment, my wife being one of them. During the Belgian UFO wave dozens of people had their photos of these craft developed and the results were blurred photos. This happened during the Marian Apparitional sightings in Fatima. It happened to John Alexander at Skinwalker ranch. If all of these things are different entities with different agendas, which they may very well be, they are AT A MINIMUM complicit together in this “rule” of withholding absolute proof of any paranormal phenomenon from the general public and indeed from humanity as a whole. This holds itself true in every area of paranormal study time after time after time again. At least with regards to non-direct experiencers and documentation goes. Now if the government has recovered alien hardware, we’re gonna have to take aliens off of that list. I just don’t know if they do or not. I agree - this is an important point. However, if the government only has crashed (i.e. broken) alien hardware - that doesn't actually do anything - imagine showing someone from the 1930's the latest Intel chip. They might be curious what it was for - but never believe you if you explained. Put the way you have, it does seem as though there is an intelligence at work keeping the paranormal secret. In a way, this also seems to apply to UFO's themselves, because they could, as the saying goes, land on the White House lawn - or at a pop concert, or whatever. Conceivably they want us to develop as naturally as possible, while still trying to guide us in certain directions. Another possible slant on this might be that most of these phenomena are distortions of consciousness - including distortions of consciousness spread over multiple people. This wouldn't make them any less paranormal.